Some spoiler pics after the cut (from Annie via Baidu). Any translations are from Nacchan. Link is also up at Bleach Asylum. ginjou : "I also thought of you as my nakama"
Ichigo : "is that so, I'm glad"
I'm quoting dear Nacchan on this: OH LOOOOL ISHIDA USING ULQUIORRA'S LINE XDD Ulq "ore to koi onna" // Uryuu "kochi he koi kurosaki"
SO FAR, it appears that Ishida was actually cut by Tsukishima, not bookmarked, because he bled. Ichigo was cut by Ginjou. Ulquiorra and Ishida read from the same pick up line book it seems. 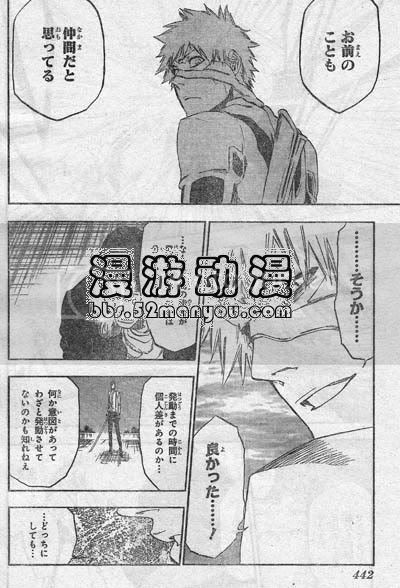 Ginjou's laughing way too evilly for someone who was merely past-altered into having Tsukishima as a friend. None of the others turned that evil. I would love it if Ginjou is doing all this to get his shinigami powers back. The look on Ichigo's face would be just... precious. I KNEW THOSE EYEBROWS WERE NOT TO BE TRUST. Nobody with a pure soul has those eyebrows nobody. Duuude! Even Aizen knew that when yandereing. Ginjou: "I'll take it. Your fullbring." Bleach Fandom: YES PLEASE TAKE THE KAMEN RIDER SPERM OUTFIT FAR, FAR AWAY. Did we ever even get the name for it?! Maybe Ginjou will use it and say its name. It doesn't need to have a name. Ginjou can have it .__________. I'm also running with the cut, not bookmarked theory. It wouldn't make sense to bookmark him in terms of plotting so late in the game. However, why Tsukishima would *choose* to cut him, rather than bookmark has got my brain all a-flutter. Why is Ishida getting special treatment? Or maybe he isn't, but Quincy physiology means bookmarking doesn't work? Well, maybe he has been bookmarked and Ginjou and Tsukishima will make off with all of Ichigo's (powered) friends. Those wearing slash goggles have been spoiled this week, what with the omake at the end of the anime episode as well. 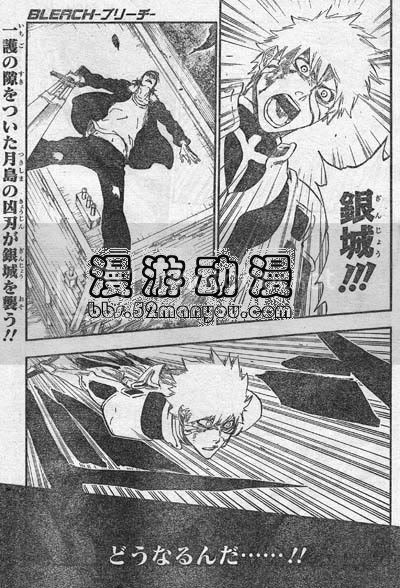 My squee page was Ishida Kurosakikunning so hard that he's got distracted from the fight. Tsk tsk, Ishida - not like you to muck up such basic fight awareness must be love. LOL Ginjou=Bleach's Kira. I mean come on, that laugh. And the whole memory deal. Yeah. 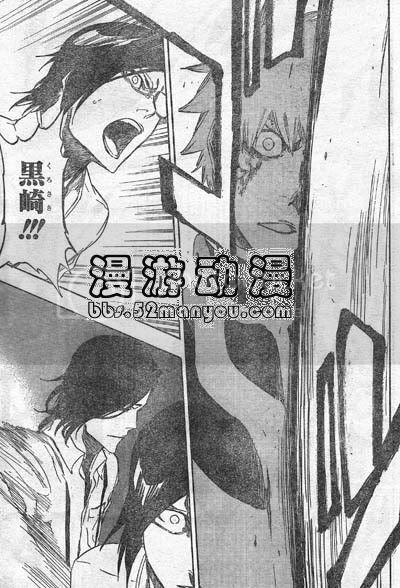 I SEEE RUKIAAAAAAAAAAAA (and ichigo) in the next page after that (if you tilt the screen back, it helps). Looks like a new image of her; can't wait for someone to scan it clearly. Anywho, I'm excited for the next chapter. Right through the chest. 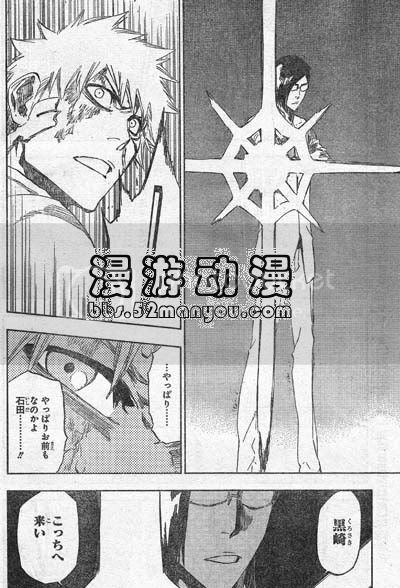 ;; Looks like some theories about Ichigo dying might be true. I maintain that Isshin, Urahara and Co. are going to kill him with that sword and get his shinigami power back the old fashioned way. So, are we having the official Ros victory celebration party in the actual chapter thread? Take the fullbring Ginjou, just take it please. 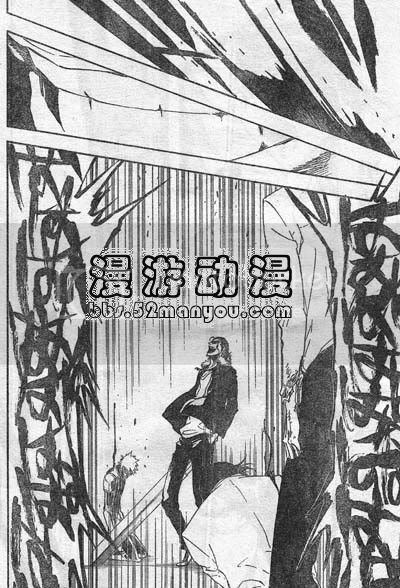 This is just more evidence in Bleach that you should never ever ever trust a man that has fur on his collar. Ichigo knows this better than most, his battle buddy has a fur-collar and is weird as hell and he doesn't trust him. Bleach has a like sixty-six percent fur-collar to total creepazoid ratio. If you must ask I am including Hihiou Zabimaru and Ichigo because of the Cover of volume 49. Yes! The worst has finally come! Time for the calvary to kick in, Kubo. Her's another thought for the pot. Do the Fullbringers and the Quincy have some sort of mutual history? Might that explain why Ishida was slated for injury/death rather than a convenient mindwipe?